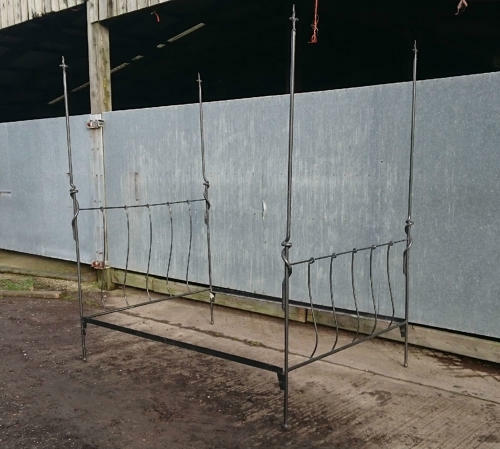 A beautiful, reclaimed, black wrought iron bed frame. The bed has a fantastic design, with very large bed posts with flur-de-lys finials. The posts have twisted detailing in the centre and the bed has serpentine shaped head and end boards. The bed has L shaped frame ready for slats, to be supplied by purchaser. The bed can be taken apart for storage and transportation and fits easily together with thick pins and reciever. The frame is reclaimed and therefore has some character signs of wear and use. The bed is lacquered and there are knocks, scratches and chips to the lacquer in certain areas. There are some small patches of surface rust. The frame has some scratches and marks. The bed has a very unique design and has great style and quality. The bed has a slightly Gothic style and would be ideal for both a modern and period property. A very desireable and stylish item. Bed frame 138.3cm x 198cm, Height of posts 216cm approx.